・NEW! Chapter on CT and MR contrast media gives you a better understanding of the agents used to alter patient contrast. ・NEW! Information on digital imaging helps you understand the latest advances in digital imaging. ・NEW! Chapter on dental radiology covers common dental issues you may encounter in practice. ・NEW! Chapter on MR spinal imaging provides the latest information on the diagnosis of spinal cord disease through the use of CT and MRI. ・Coverage of ultrasound imaging procedures such as the esophagram, upper GI examination, excretory urography, and cystography helps in determining when and how these procedures are performed in today's practice. ・Rewritten chapters on basic interpretation emphasizes radiography, radiation safety, superficial coverage of normal variants, and will include more in-depth information on the framework for interpretation. ・An atlas of normal radiographic anatomy in each section makes it easier to recognize abnormal radiographic findings. 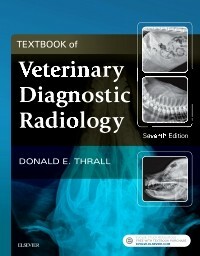 ・High-quality radiographic images clarify key concepts and interpretation principles. ・Up-to-date coverage of the most commonly seen species in private veterinary practices and veterinary teaching hospitals includes the cat, dog, and horse.